A radionuclide (radioactive nuclide, radioisotope or radioactive isotope) is an atom that has excess nuclear energy, making it unstable. This excess energy can be either emitted from the nucleus as gamma radiation, or create and emit from the nucleus a new particle (alpha particle or beta particle), or transfer this excess energy to one of its electrons, causing that electron to be ejected as a conversion electron. During those processes, the radionuclide is said to undergo radioactive decay. These emissions constitute ionizing radiation. The unstable nucleus is more stable following the emission, but will sometimes undergo further decay. Radioactive decay is a random process at the level of single atoms: it is impossible to predict when one particular atom will decay. However, for a collection of atoms of a single element the decay rate, and thus the half-life (t1/2) for that collection can be calculated from their measured decay constants. The range of the half-lives of radioactive atoms have no known limits and span a time range of over 55 orders of magnitude. Radionuclides occur naturally and are artificially produced in nuclear reactors, cyclotrons, particle accelerators or radionuclide generators. There are about 650 radionuclides with half-lives longer than 60 minutes (see list of nuclides). Of these, 34 are primordial radionuclides that existed before the creation of the solar system, and there are another 50 radionuclides detectable in nature that are daughters of these, or are produced naturally on Earth by cosmic radiation. More than 2400 radionuclides have half-lives less than 60 minutes. Most of those are only produced artificially, and have very short half-lives. For comparison, there are about 254 stable nuclides. All chemical elements have radionuclides. Even the lightest element, hydrogen, has a well-known radionuclide, tritium. Elements heavier than lead, and the elements technetium and promethium, exist only as radionuclides. Radionuclides are produced in stellar nucleosynthesis and supernova explosions along with stable nuclides. Most decay quickly but can still be observed astronomically and can play a part in understanding astronomic processes. Primordial radionuclides, such as uranium and thorium, exist in the present time because their half-lives are so long (>80 million years) they have not yet completely decayed. Some radionuclides have half-lives so long (many times the age of the universe) that decay has only recently been detected, and for most practical purposes they can be considered stable, most notably bismuth-209: detection of this decay meant that bismuth was no longer considered stable. It is possible decay may be observed in other nuclides adding to this list of primordial radionuclides. Many of these radionuclides exist only in trace amounts in nature, including the two shortest-lived primordial nuclides and all cosmogenic nuclides. Secondary radionuclides will occur in proportion to their half-lives, so short-lived ones will be very rare. Thus polonium can be found in uranium ores at about 0.1 mg per metric ton (1 part in 1010),. Further radionunclides may occur in nature in virtually undetectable amounts as a result of rare events such as spontaneous fission or uncommon cosmic ray interactions. In astronomy and cosmology radionuclides play a role in understading stellar and planetary process. 9 9 110 min β+,EC 633/1655 Cosmogenic positron source, synthesised for use as a medical radiotracer in PET scans. Most household smoke detectors contain americium produced in nuclear reactors. 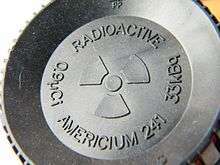 The radioisotope used is americium-241. The element americium is created by bombarding plutonium with neutrons in a nuclear reactor. Its isotope americium-241 decays by emitting alpha particles and gamma radiation to become neptunium-237. Most common household smoke detectors use a very small quantity of 241Am (about 0.29 micrograms per smoke detector) in the form of americium dioxide. Smoke detectors use 241Am since the alpha particles it emits collide with oxygen and nitrogen particles in the air. This occurs in the detector's ionization chamber where it produces charged particles or ions. Then, these charged particles are collected by a small electric voltage that will create an electric current that will pass between two electrodes. Then, the ions that are flowing between the electrodes will be neutralized when coming in contact with smoke, thereby decreasing the electric current between the electrodes, which will activate the detector's alarm. The 153Gd isotope is used in X-ray fluorescence and osteoporosis screening. It is a gamma-emitter with an 8-month half-life, making it easier to use for medical purposes. In nuclear medicine, it serves to calibrate the equipment needed like single-photon emission computed tomography systems (SPECT) to make x-rays. It ensures that the machines work correctly to produce images of radioisotope distribution inside the patient. This isotope is produced in a nuclear reactor from europium or enriched gadolinium. It can also detect the loss of calcium in the hip and back bones, allowing the ability to diagnose osteoporosis. Following is a summary table for the total list of nuclides with half-lives greater than one hour. Ninety of these 905 nuclides are theoretically stable, except to proton-decay (which has never been observed). About 254 nuclides have never been observed to decay, and are classically considered stable. The remaining 650 radionuclides have half-lives longer than 1 hour, and are well-characterized (see list of nuclides for a complete tabulation). They include 28 nuclides with measured half-lives longer than the estimated age of the universe (13.8 billion years), and another 6 nuclides with half-lives long enough (> 80 million years) that they are radioactive primordial nuclides, and may be detected on Earth, having survived from their presence in interstellar dust since before the formation of the solar system, about 4.6 billion years ago. Another ~51 short-lived nuclides can be detected naturally as daughters of longer-lived nuclides or cosmic-ray products. The remaining known nuclides are known solely from artificial nuclear transmutation. This is a summary table  for the 905 nuclides with half-lives longer than one hour (including those that are stable), given in list of nuclides. Energetically unstable to one or more known decay modes, but no decay yet seen. Spontaneous fission possible for "stable" nuclides ≥ niobium-93; other mechanisms possible for heavier nuclides. All considered "stable" until decay detected. 164 254 Total of classically stable nuclides. Radioactive primordial nuclides. 34 288 Total primordial elements include uranium, thorium, bismuth, rubidium-87, potassium-40 plus all stable nuclides. Radioactive nonprimordial, but naturally occurring on Earth. ~ 51 ~ 339 Carbon-14 (and other isotopes generated by cosmic rays) and daughters of radioactive primordial elements, such as radium, polonium, etc. Radioactive synthetic (half-life ≥ 1.0 hour). Includes most useful radiotracers. 556 905 These 905 nuclides are listed in the article List of nuclides. This list covers common isotopes, most of which are available in very small quantities to the general public in most countries. Others that are not publicly accessible are traded commercially in industrial, medical, and scientific fields and are subject to government regulation. For a complete list of all known isotopes for every element (minus activity data), see List of nuclides and Isotope lists. For a table, see Table of nuclides. ↑ "Decay and Half Life". Retrieved 2009-12-14. ↑ Eisenbud, Merril; Gesell, Thomas F (1997-02-25). Environmental Radioactivity: From Natural, Industrial, and Military Sources. p. 134. ISBN 9780122351549. ↑ Severijns, Nathal; Beck, Marcus; Naviliat-Cuncic, Oscar (2006). "Tests of the standard electroweak model in nuclear beta decay". Reviews of Modern Physics. 78 (3): 991. arXiv:nucl-ex/0605029 . Bibcode:2006RvMP...78..991S. doi:10.1103/RevModPhys.78.991. ↑ "Smoke Detectors and Americium". world-nuclear.org. ↑ "PNNL: Isotope Sciences Program – Gadolinium-153". pnl.gov. ↑ "Gadolinium". BCIT Chemistry Resource Center. British Columbia Institute of Technology. Retrieved 30 March 2011. ↑ "Ionizing radiation, health effects and protective measures". World Health Organization. November 2012. Retrieved January 27, 2014. Martin, James (2006). Physics for Radiation Protection: A Handbook. p. 130. ISBN 3527406115. Luig, H.; Kellerer, A. M.; Griebel, J. R. (2011). "Radionuclides, 1. Introduction". Ullmann's Encyclopedia of Industrial Chemistry. doi:10.1002/14356007.a22_499.pub2. ISBN 3527306730.